Do you need to buy or sell gold or silver bullion or coins? The Honest Gold Guy Spokane Valley is a local gold and silver coin dealer. I buy and sell most gold and silver products such as pure or .999 fine bullion, U.S. 90% silver coins, Canadian 80% silver coins, and more. I will be happy to meet with you and give you fair value for your gold or silver coins. Don't forget to get out any broken gold or silver jewelry, and silver flatware if you are thinking about selling it. I buy and sell U.S. 90% silver coins (aka junk silver) made prior to 1965. These would include dimes, quarters, half dollars, and dollar coins. I also buy and sell gold and silver bullion bars, rounds, .999 fine American Eagles, .999 fine Canadian Maple Leaf's, Canadian 80% silver coins, and more whether circulated or not. While it's rare to find silver coins in your change anymore, some people do. Occasionally an old silver dime or quarter get's spent in change. The most likely find you'll have in change is the 40% Kennedy half dollar. These 40% silver coins were made from 1965 through 1970. They are still found in coin rolls as they look similar to the regular clad coins of today. We buy Kennedy half dollars, even the 40% ones. If you have old silver coins, please do not clean them. Cleaning a rare silver coin actually lowers it's value as you may scratch or ruin it's natural patina during cleaning. Old silver coins are expected to have some tarnishing, so that is okay. All silver coins are valuable for their silver content. Most silver coins do not have much collectible value. Silver coins that have numismatic value are usually in uncirculated condition. I will give you a free appraisal on all your silver coins when we meet. The higher the silver content of the coin, the more we can pay for it. Here are some of the silver coins we buy, and their silver content. This would also include some coins from U.S. possessions like Puerto Rico, and the Philippines. Silver dimes, quarters, half dollars and dollars older than 1965 are 90% silver. Kennedy Half Dollars from 1965 to 1970 are 40% silver. The only silver nickels are war nickels from 1942 through 1945. They're 35% silver. Silver American Eagles from 1986 to present day are .999 silver. (Nearly pure silver). Like American coins, some Canadian coins have silver content. *1967 & 1968 silver Canadian Coins can be identified using a magnet. There are many places to sell silver coins, but not many that will give you as good of a price as I will. 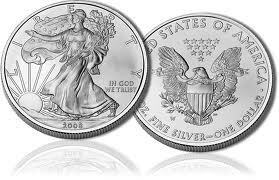 If you are ready to sell silver coins I would be happy to meet with you and give you a quote for each item. If you like my offer I will pay you on the spot to buy your silver coins, sterling silver, pure silver, or gold.